Cannot trust this joker Durian stall called SIN DURIANS. Seriously, FALSE advertising abt delivery. 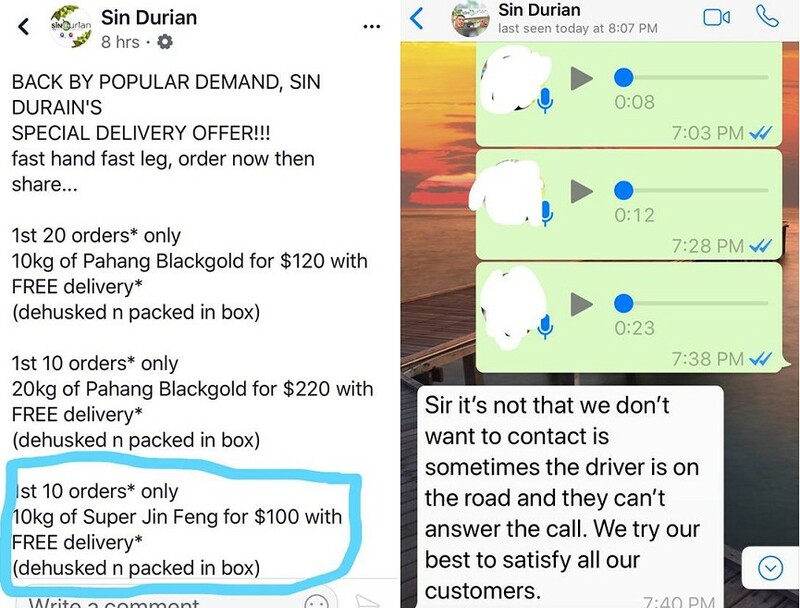 I ordered at abt 3pm for their Jin Feng. They told me they will deliver at ard 4-7pm (they said try to). At 6.45pm I ask them help me contact driver. They say peak hr so take longer. At 7.30pm they gave me the driver contact. Called driver, he say he’s at Yishun. Still got 9 more trips to send. Even IF Yishun shoot down to Clementi area, also need 30mins or so even no heavy traffic. If really reach, 10pm.. my durians from 3pm open until 10pm.. KNN ALL NOT FRESH ALREADY. Previous ArticleSG BMW DRIVER FOUND WALLET IN JB AND WENT OFF. WHERE ARE YOU? !